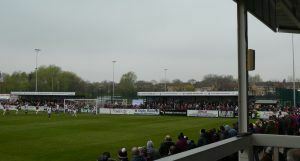 South Shields stayed within a point of Farsley Celtic at the top of the Northern Premier League thanks to an emphatic victory over mid-table Hednesford Town. Nathan Lowe’s ninth minute strike gave Shields a narrow half-time lead. But the home side managed to up the tempo after the break with goals from Connor Bell and a double from Rob Briggs. Hednesford’s only response came through Brad Wells in the 66th minute. Farsley’s four point margin at the top was cut to one when North Ferriby’s record was expunged, but neither side seem to be letting anything slip in the promotion race. The Mariners got off to a perfect start when Lowe drove forward in the ninth minute and released an accurate driven effort from just outside the box into the bottom-left corner. Briggs almost added a second in the 27th minute when his free-kick nearly deceived Jake Weaver but the ‘keeper just about managed to tip it onto the post. Reece King came close to equalising with a strike towards the left corner from inside the box in the 33rd minute but Liam Connell made a fantastic save. 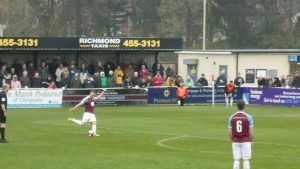 South Shields doubled their lead within seven second-half minutes. Bell raced through onto Craig Baxter’s ball from deep and added a cool finish one-on-one to score his first Mariners goal. The home side began to run away with it and Briggs bundled home Lowe’s superb low cross in the 58th minute. The Pitmen pulled a goal back when Alex-Ray Harvey’s corner found its way to Brad Wells who forced the ball into the goal at the back-post. But that did not prove to be a way back into the game for the visitors as Daniel Racchi conceded a penalty when he brought down Phil Turnbull in the box. Briggs restored the three-goal margin, firing into the right corner past Weaver who guessed the right way.